Description/Historical Information: Two older men outside front door [same as VLA5135]. 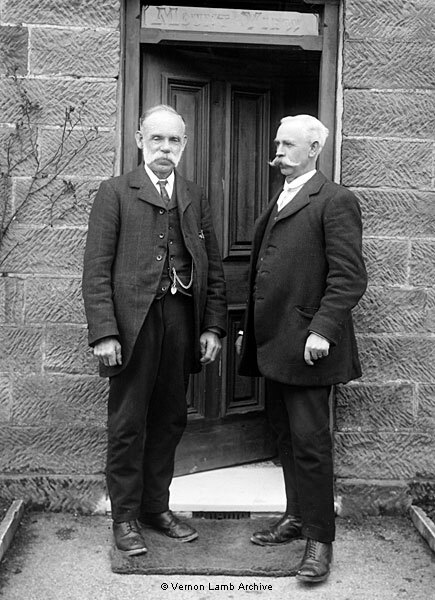 Daniel Fleet, an Insurance Agent who was born at Christlton in Cheshire at the beginning of the 1860s, is on the right. He and his family moved to Mount View after 1911 (they were at Gresley Villa that year) and were still there in 1915. The gentleman on the left, who appears on other pictures, might be Daniel's brother (either Samuel or Richard). Daniel also appears with his family on VLA5115 and his two daughters can be seen on VLA5121. elsewhere on this site: - Matlock: The Fleet Family of Bakewell Road and the Dimple.